While all eyes are currently on The Force Awakens, which is set to be released in just a few short months, production is already in full swing on the next Star Wars film, Rogue One. 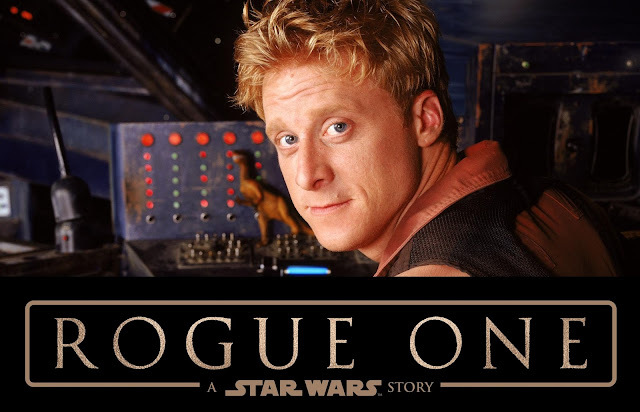 Among the talented roster of actors that have been cast in the film is Alan Tudyk, who has been previously know for his role as Wash in Joss Whedon's beloved, and short lived, sci-fi series Firefly. Most recently he's been getting attention for the new web series "Con Man", in which he writes, directs and stars. In Rogue One he portrays a yet to be revealed motion capture character alongside co-stars Felicty Jones, Donnie Yen, Mads Mikkelsen and Diego Luna, among others. "[Gareth] offered it to me in the room - it didn't seem real," Tudyk recalled. "I said, 'I would love to say yes, but it is contingent on one thing. I can't believe I'm saying this, but if you're shooting in June, I have to say no' - because that's when we were shooting Con Man, and I couldn't figure out how to reschedule it." "It's more fun on a movie set than I've had in a very long time. I didn't know what to expect. I really like my fellow cast-members - Diego Luna and Felicity Jones, I see them a lot, most of my scenes are with them. And Gareth is great." "There's always those days that are really hard. You're wet, you're cold, it's way early... there's some interesting things when you're on-set that can be challenging.... But when you get into that moment of, 'This is hard, this is terrible, I'm miserable' and then you're like, 'Oh look, it's Star Wars!' and that feeling is immediately erased. It doesn't last for a breath - you can't even get it out without going, 'But look over there! And look at that!'" It's always interesting to hear "what if" stories like this. Thankfully this one has a happy ending and it sounds like production is going smoothly. It's also intriguing to know that Tudyk will be sharing much of his screen time with Diego Luna and Felicity Jones in Rogue One. It would be fun to speculate what this could mean for the story, but as this point we know very little if anything about these characters. Nevertheless, all will be revealed when Rogue One: A Star Wars Story hits theaters on December 16th, 2016!